There are so many ways that a person can try to achieve their fitness goals. 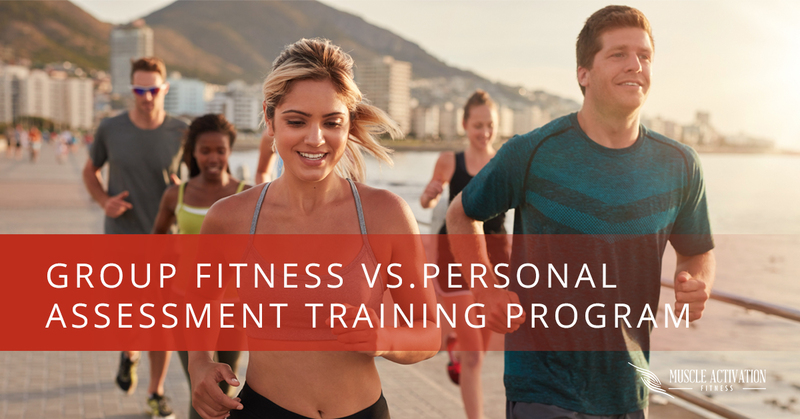 I feel that a growing trend over the past few years that people are flocking to in an attempt to get to their fitness goals are group fitness classes or clubs. I have gone to many group fitness classes over the years. I have gone to pilates, yoga, spin/cardio, CrossFit, and so many more. I will say that the main reason I went to these classes was because there was a great instructor and/or the group of people made me want to go over and over again. I feel this is the main driver of these classes. In each of these, I got a great experience and enjoyed the people I was around. The main thing that a group fitness class is missing, no matter what kind of class it is, is that it is tailored to the group and not the individual. What I mean by this is that everyone understands that each human body is different and reacts or responds to things differently that someone else. Different people have different biomechanics, different limb lengths, different physiology. At Muscle Activation Fitness, our specialists takes all of these things into account. Some people cannot tolerate a lot of carbohydrates in their diet, while others flourish with more carbohydrates. One pair of jeans fits great on one person, while for some reason on another person, they don’t fit at all. Exercise is similar. Every person’s body is different and has different abilities. These abilities are where a personal assessment and plan that is based off this assessment is crucial. An example would be, in the Muscle Activation Fitness assessment and program, your lack of motion or flexibility is assessed at every joint in their body. The information taken from the exam is used to help omit or qualify specific exercises for an individual based on their goals and needs. The goals of the individual drive the type of program written. If the goal of the program is hypertrophy, there are specific training principles that create that adaptation. If the goal is endurance, the program is written with those principles in mind as well. This is done to decrease and/or slow down the wear on a person’s joints and improve their flexibility as well as create the specific adaptations stated from the individual’s goals. When I have gone into a group class, the instructors tried to do their best to accommodate and create a safe class, but there is no way that an instructor can see and modify for each and every person in class, especially if the class is very popular. Group fitness classes are also planned by the instructor to give a very good workout and experience. This is not a bad thing, if that is the only reason for someone to go to the class and that is okay. But, if you are trying to create specific changes in your body, you need to do specific things to create that change. So, is group fitness bad? NO! Group fitness has gotten so many people off the couch and into exercise and weight loss. I do believe that every person should get some one-on-one instruction from their instructor to make sure they are doing what they need to do in order to achieve their goals as well as stay injury free. What are you doing to make your body the best it can possibly be? It is your greatest resource. Let Muscle Activation Fitness guide you to move, feel, and perform your best for the rest of your life.